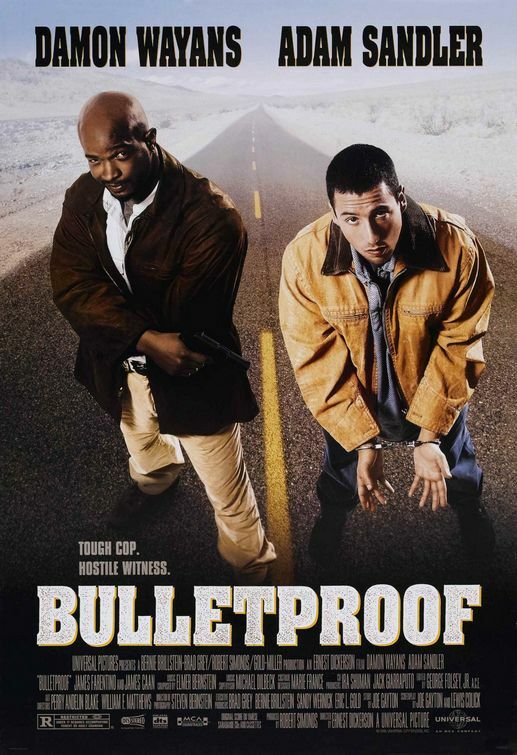 Bulletproof is so hastily thrown together and so very linear that it practically allows Damon Wayans and Adam Sandler to sleepwalk through it. So they do. Rock (Wayans) and Archie (Sandler) were fast friends turned mortal enemies. Without over explanation Archie felt Rock let him down, and Rock was perturbed when Archie shot him in the head. Both have a point to varying degrees. Further misunderstandings force the two now enemies on the run from the cops, the bad guys and the crime boss played by James Caan in ‘what day is payday again?’ mode. Along the way both Sandler and Wayans banter awkwardly despite the almost constant peril that they find themselves in, Sandler gets to sing a Whitney Houston song, and Wayans gets to ‘deflower’ him with a gun barrel. It’s all very uninspired and at best mildly amusing. Something to burn ninety harmless minutes with. Wayans and Sandler have reasonable chemistry but are saddled with a plot that gives them little to work with. Then again in watching their respective ‘careers’ unfold after this movie, there’s every chance that that’s just the way they like it. Final Rating – 6 / 10. 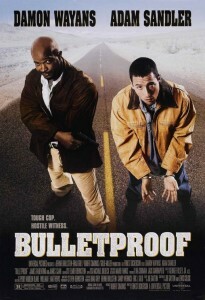 Bulletproof might be a solid albeit misleading title, but it is hardly descriptive of this film.